I’ve already made several references to Luca Conte, who served in the U.S. army at around the same time as Babe. The first reference was in this post, in which we confirmed that he and Babe left the United States out of Newport News, Va. The second was in the actual letter Babe wrote in which he refers to seeing “Lugi” Conte “on the boat coming over.” The Conte family was friends of my grandmother’s in Mount Kisco. I remain puzzled about why Babe’s letter refers to him as “Lugi” when his name was Luca. The final reference was in another post trying to pin down Babe’s initial movements after he arrived in North Africa. The source for the following is primarily through personal conversations I had with Dad, although I did request and receive some records from the National Personnel Records Center (NPRC). Dad was reluctant to talk about his military experiences, and when we finally did get into detail—especially about Anzio—he cried, even after over 50 years! Luca and Jane Conte; they met in Naples, Italy. She was an Italian national. 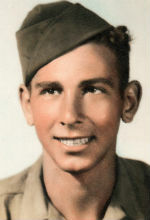 Luca George was inducted into the army just before Christmas 1942, about two months before Babe, though he was apparently a few years older than Babe. Luca had been at the University of Pennsylvania, while Babe had just graduated from high school. Ultimately, Luca went to what was the Military Intelligence Training Center at Camp Ritchie, Md., and trained as an Italian interpreter. Nearly 10 months after his induction, he found himself in Naples, Italy, assigned to the Allied Military Government, the military command serving as the governing body for occupied Italy. Almost immediately, while serving as an interpreter and typist there, he met Jane DeAngelis, an Italian national working as a clerk for the Italian authorities. Pia Conte; her father, Luca, came across with Babe on the boat from the United States. They courted through their separation over the next couple of years, but ultimately they married on June 24, 1945. Luca returned to the states in November, and his wife followed in April 1946. There is much more to tell about Luca’s experience in Italy, but I thought this part of the story was so charming I couldn’t wait. Pia was kind enough to share photos of her parents, as you can see: One from when they were both very young and he was still in uniform, one from many years later, although I do not know the dates of either.